Picture: A U.S. government photograph of Operation Redwing’s Apache nuclear explosion on July 9, 1956. During the Cold War’s early years, the U.S. government detonated dozens of nuclear explosions on Pacific atolls, spreading nuclear fallout around the globe and making some areas uninhabitable, a grim legacy captured in secret documents finally being shared with the Marshall Islands’ government. More than a half century after U.S. nuclear tests shattered the tranquility of Pacific Ocean atolls — rendering parts of them uninhabitable – the U.S. government has quietly released secret fallout results from 49 Pacific hydrogen-bomb blasts with an explosive force equal to 3,200 Hiroshima-size bombs. The U.S. government turned over to the Republic of the Marshall Islands 650-plus pages of newly declassified documents that include four reports detailing fallout results of 49 tests it conducted in Operation Redwing in 1956 and Operation Hardtack in 1958 at Bikini and Enewetak atolls, according to a three-paragraph press release posted on the web site of the U.S. Embassy in the capital city of Majuro on June 12. U.S. Ambassador Thomas Armbruster presented the previously classified nuclear documents detailing fallout results to the President of the Republic of the Marshall Islands (RMI), Christopher Loeak, and his Cabinet, The Marshall Islands Journal reported. The Journal also indicated that RMI officials are now reviewing these documents, which they had requested. Several documents listed in the press release had been extracted and declassified in the 1980s though they received little public notice. Before the nuclear tests, the U.S. government removed all atoll inhabitants; some are still exiled from their radioactive ancestral homelands. All 49 hydrogen-bomb tests were laced with plutonium, one of the deadliest elements known to humankind with a radioactive existence of half a million years. From 1946 to 1958, the U.S. government conducted 66 nuclear weapons tests from and near the two atolls of Bikini and Enewetak, when the U.S. administered the Marshall Islands under a U.N.-sanctioned trust arrangement. The reports provide technical and scientific data on results of these second and third most destructive nuclear-weapons operations the U.S. ever conducted and the last ones it exploded in the Marshall Islands and the surrounding waters. The reports detail instruments and procedures used to capture and measure fallout from experiments conducted on the atolls, underwater or in the atmosphere. Included are diagrams of flight patterns flown to capture fallout in the clouds, tables listing each detonation, maps showing blast locations plus graphs and charts detailing measurements of old and new radioactive products that were collected by using technical instruments such as spectrometers, aerial radiation detectors or telemeters. Not until 1993 did the U.S. declassify information on the explosive force or magnitude of 44 of the 66 nuclear weapons tests conducted at Bikini and Enewetak atolls so as to inform Marshallese and U.S. test personnel. Now, the newly declassified U.S reports give Marshallese and others more fallout results of those explosions. The fallout from the 49 explosions in Redwing and Hardtack is hard to comprehend. In 1994, when the U.S. government released details about its 1,054 nuclear tests worldwide from 1945 to its last one in 1992, the data showed the yield – the explosive force – of Operations Redwing and Hardtack at more than 48,846 kilotons, or the equivalent of about 3,200 Hiroshima-size bombs. Operation Redwing included tests to assess military effects. Hardtack centered on developing missile warheads and high-yield strategic hydrogen bombs. The next-to-last test in the Redwing series, codenamed Tewa, was launched from a reef at Bikini and packed a yield of 5,000 kilotons — which equates to 333 Hiroshima-size bombs. “Tewa was so powerful it lit up the sky in Hawaii,” a U.S. serviceman identified as Carl Duncan is quoted as saying in describing that blast 2,500 miles from Honolulu. Tewa’s fallout was about 30 percent of its total yield of 5,000 kilotons and contaminated 43,500 nautical miles of ocean, according to “Operation Redwing: Fallout Location and Delineation by Aerial Surveys,” as first declassified in 1988. The U.S. gave a newly declassified version of this report to RMI officials. “Eniwetak was still receiving heavy fallout from the Tewa cloud,” when the next blast, codenamed Huron (each blast was named after a Native American tribe), was detonated the following day, Harris recounted. The Huron blast of 250 kilotons equates to 16 Hiroshima-size bombs. In contrast, the Eisenhower administration at the time disclosed that the Redwing series had powdered Enewetak with only “light” radioactive fallout. When a Soviet diplomat delegated to the U.N. Trusteeship Council asked whether these islands must be “lost forever,” the U.S. official in 1956 replied that Bikini and Enewetak might be uninhabitable for at least two generations. Today Bikini and parts of Enewetak are still too radioactive to be safely inhabited. His answer came decades later. Those present at Operations Redwing or Hardtack or for six months afterward who succumb to one of 19 primary cancers are eligible for $75,000 compensation made available by Congress. At the time of Operation Redwing in 1956, the U.S. government under President Dwight Eisenhower released very little information. This secrecy was politically significant because it kept voters in the dark during the presidential election campaign in which Democratic candidate Adlai Stevenson advocated stopping the H-bomb tests being conducted by the Eisenhower administration. During the election year, U.S. officials announced only two of the 17 blasts in the Redwing series. This virtual blackout hid from U.S. voters over 77 summertime days during the presidential election campaign Redwing’s 20,820 kilotons of explosive force — or the equivalent of 1,388 Hiroshima-size bombs. That tonnage is the equivalent of 18 Hiroshima-size bombs per day over 77 days. Seven Redwing tests received no public notice and the remaining eight blasts were disclosed by Japanese scientists in news articles datelined Tokyo. Thus the fastest and most accurate information about U.S. Redwing testing was disclosed from Tokyo by Japanese, an immense irony given that only a decade earlier, U.S. atomic bombs had contributed to Japan’s surrender by destroying two of its cities. Eisenhower handily won re-election. The more powerful 32 detonations in Operation Hardtack were launched in 1958 as the U.S. and the Soviets raced toward declaring a moratorium on such experiments and the U.S. accelerated testing missile warheads. Washington disclosed only nine of the 32 blasts that produced a total yield of 28,026 kilotons, or the equivalent of 1,868 Hiroshima-size bombs – an average of 35 per week in 1958 or five per day. That was the lowest disclosure rate of any U.S. Pacific testing operation. Even more ironic than the Japanese disclosures in 1956 were the Soviet ones about the 1958 Hardtack detonations. The Soviets charged that the U.S. had concealed most of the tests being conducted, which even U.S. officials deemed accurate. Samples made during several Hardtack tests showed that fractions of the radioactive elements of strontium and cesium were dispersed over distances of more than 4,000 miles, according to a report titled “Operation Hardtack: Fallout Measurements by Aircraft and Rocket Sampling” dated 1961 and declassified in 1985. The U.S. gave a newly declassified version of this report to RMI officials. That 4,000-miles range means the radioactive elements could have descended on San Francisco and other West Coast areas. Both radioactive elements pose serious health problems. The decades-long delay in receiving a full accounting of these fallout results helps to substantiate the contention of the RMI that its negotiators were denied vital information when they agreed in 1986 with President Ronald Reagan to form an independent nation, thus ending the American administration of the U.N.-sanctioned trust territory established in 1947. Kept in the dark about the fallout results, the Marshallese agreed to terms so insufficient that a U.S.-financed $150 million nuclear-claims trust fund is now penniless, unable to compensate fully Marshallese for health and property damages presumed to have resulted from the tests. RMI’s appeals to Congress, the U.S. courts and the Bush administration have been turned back and the Obama administration has yet to help them. –Consider issuing a presidential acknowledgment and apology to victims adversely affected by the 66 weapons tests it conducted when it administered the Marshall Islands as a U.N. strategic trust territory. Over the decades, the Marshallese have not been alone in wanting more information about the nuclear tests. In 1954, the Association of State Health Officials voted to ask the federal government to give health officials with security clearances access to classified atomic energy information so as to prevent health hazards. 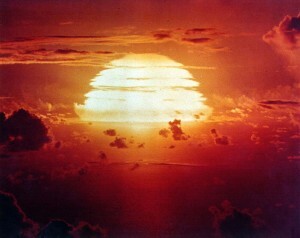 From 1945 to 1992, the United States carried out 1,054 nuclear tests worldwide. Beverly Deepe Keever is the author of News Zero: The New York Times and The Bomb and the newly released Death Zones and Darling Spies: Seven Years of Vietnam War Reporting.